Listen to the podcast for the full version of these tips! Spare yourself loads of dishes by using less tools, not more. Measure dry ingredients, then wet, so you can reuse bowls, and measuring cups and spoons. Handy tip: Measure your oils in a measuring cup, then measure honey and it will slide right out! Are there certain foods/tasks/preparations that meet duplicate dietary goals? Can you prepare one food instead of two and therefore make your life easier? These are foods that pack a punch. For instance, we all should eat fruits and vegetables right? Fermented fruits and vegetables (like kraut, chutney, pickles, etc.) provide vegetables but also our need for cultured foods. Here's another example. When you make cookies or muffins, create the batter and save the time during baking by turning them into bar cookies or a quick bread. That can shave 15 minutes to a half hour off the total time. Headed into a busy few days? Make up a bunch of mix and combine menu items, like assorted breads (sourdough tortillas or english muffins) or cooked rice, refried beans, seasoned and cooked ground beef, onion and garlic mixture, chopped veggies, shredded cheese. Then through those busy days, you can have rice bowls, burritos, tacos and easy sandwiches off these ingredients. If you switch things up a bit every time, which is what I do with my no-recipe required skillet dishes, no one will feel they’re eating the same meal for four days. Or another approach would be to make a big pot of soup that can be eaten for a few days. Hi Lise Williams, I really love your input about women working together to help and support each other and to also cut the costs of food. I feel passionate about helping people ditch processed foods and cook whole organic foods at home but one of the biggest challenges people have is the high cost of organic food. I have been tossing around some ideas to make healthy foods more accessible to more people and have some thoughts about doing community shared gardens in that they have one large garden that all share in the work and the harvest. I have been tossing a few other ideas also and the group cooking has crossed my mind but am currently thinking more about how to get good natural, free-range and organic onto peoples tables. God bless you, and thank you for sharing your wonderful community- and fellowship-oriented tips. -utilize all of your oven when you turn it on to make bread/casserole/long baking items put some squash/potatoes/muffins/beets/carrots to roast or cook alongside or ontop. Move the extra rack to the very top if needed to allow the main item airspace around it. 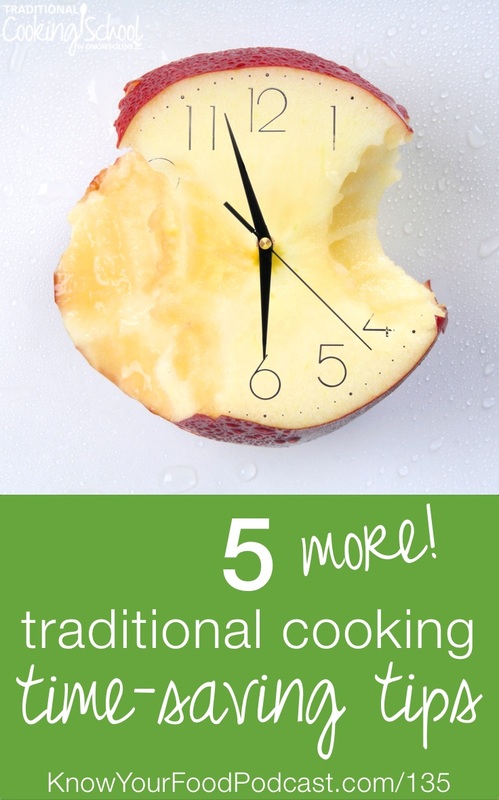 -Use your oven to cook things you’d normally prepare on the stovetop. Like bake pancakes in a cakepan and cut into squares. Bake hamburger in bulk so you don’t have to stand over it. Just break it up and drain when it’s cooked through. Bake “hardboiled” eggs. Bake all your bacon at once in the oven. -Use your Nesco or crockpot to the fullest! Cook hamburger in it, bake potatoes or sweet potatoes (keep them away from the sides of the crockpot and experiment with cracking the lid or place towel inside – under the lid to absorb moisture). Put your leftover soup, sloppy joes, etc in it at breakfast so it’s warmed and ready for lunch. If your Nesco/crockpot is big enough cook your turkey in it! Ann, hi and thank you for sharing! I just wrapped up this series so I missed including your tips in a podcast, but I will be sure and come back to add them in a future episode because they’re so good. Thank you for sharing and for the lovely words. I am happy to meet you and hear that you’re doing so well.